I woke up and was wondering why I felt pain in my knees. WOW! It’s from boxing when I crawled under my boxing friend, while she was performing pushups and doing the yoga-dog. But I have to say that I got an amazing boxing buddy. Just so crazy and super strong. I was afraid of her at first but then we became friends. I´ll miss my boxing on saturday because I’m going to go and listen to Dave. He will talk about his experiences of IRONMAN. well well, I could go and run a loop och two. 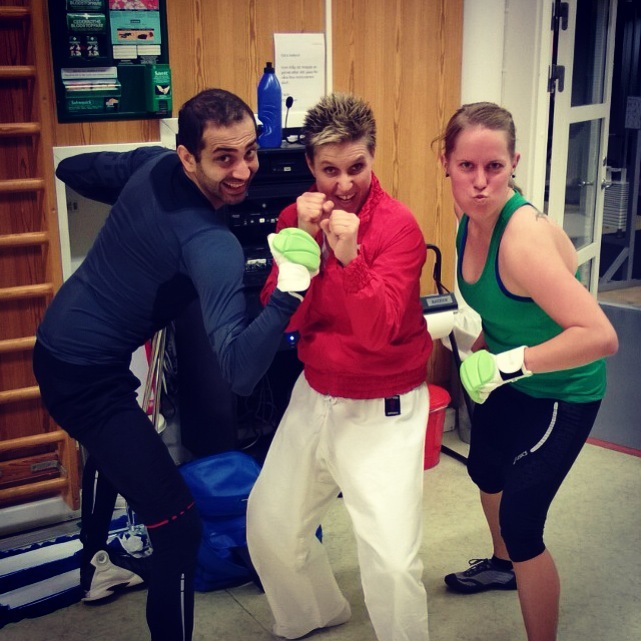 In the pic it´s my friend, the trainer Angela and me.